Please refer to our stock # TC136732 when inquiring. 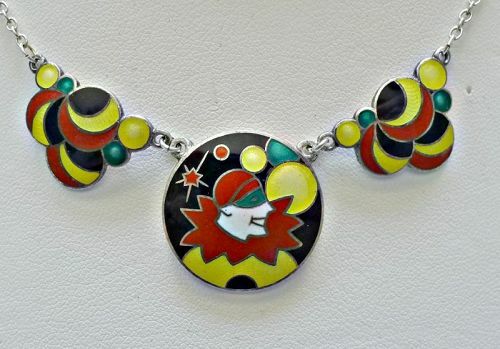 This is a really super Art Deco Sterling Pierrot Bubble Necklace - the kind that has been collected by many over the years because they come in many colors and designs. The necklace is 16 inches long and the part in the front with the three bubbles is 3 inches across. Each of the bubble pieces are marked Sterling on the back. The enamel is mostly red, yellow, and black with a bit of green here and there. The necklace is in excellent pre-owned condition with no problems - ready to wear and enjoy.